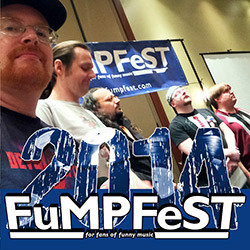 The FuMP's first convention, FuMPFest 2014, was a ton of fun, and now with this 2-CD set of live recordings from the weekend you can relive the fun, or get a taste of what you missed. This 2-CD set contains 2 1/2 hours of live comedy music from FuMPFest 2014, featuring music by Tim Cavanagh, Robert Lund, the great Luke Ski, Dan hart, Devo Spice, Tom Smith, Seamonkey, and more! Power Salad and Worm Quartet each debuted new songs. Tim Cavanagh and Robert Lund perform their biggest hits. All the artists got together to perform a tribute to Logan Whitehurst. and several guests performed during the Open Mic/FuMP Showcase. Proceeds from this album are going to help fund FuMPFest 2015, so pick up this album and help us continue to put on this awesome event for you!